Clean birds and set aside. Place flour, garlic salt, paprika, and pepper in a plastic or paper bag; add the quail breasts and shake until meat is well coated. 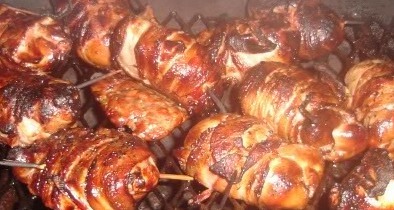 Wrap large slice of bacon around the breast of each bird. Heat shortening in medium skillet over high heat on side burner or bbq grill and brown birds on both sides. Let cook until just browned all over, about 5 min. per side, then remove the birds to a platter and keep them warm while preparing the sauce. Cook and stir onion until crisp-tender in same skillet used for quail. Blend water, cornstarch, bbq sauce and soy sauce and pour into skillet. Cook and stir constantly until sauce thickens and boils. Continue stirring and allow to boil for one minute. Add quail to sauce, heat through, and serve on bed of freshly made pico de gallo.